Regional Age Groups, Cardiff & Bognor! A very busy weekend saw our swimmers compete in the South East Regional Age Groups, Cardiff International Meet and the Vanessa Knight Meet! 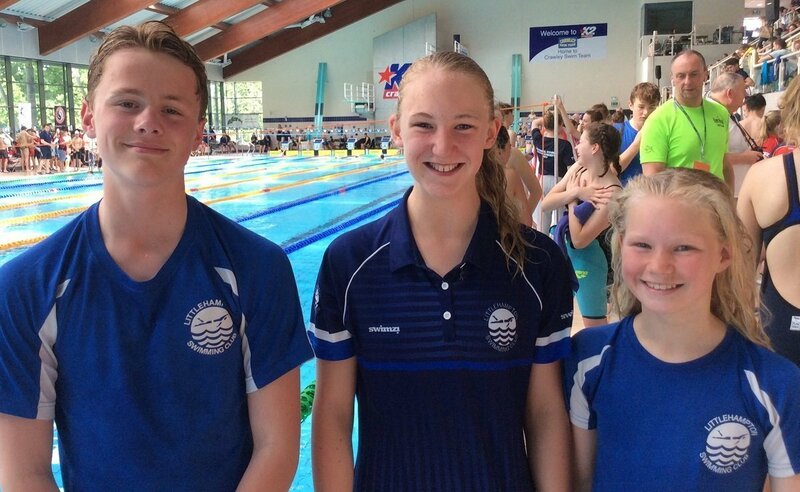 Ed Clark, Becky Smith, Ella Napier and Ella Thornburg were all in action at the second weekend of the South East Regional Age Group Championships. They had all done fantastically just to qualify, and put in some very excellent racing. Ella Napier did some huge LC PBs, knocking over 13 seconds off her 200 fly and over 5 seconds off her 200 breast (both since the counties). The 200 breast was a new 11yr girl club record! Excitingly Ella T made both the 100m and 50m butterfly finals. She finished 5th in both the heat and finals in her 100 fly, going over 1.5 seconds faster in a time of 1:12.11. In her 50 fly Ella was 5th in the heats and finished 6th in the final, despite also beating her heat time by 0.5 seconds and swimming it in 32.05. Both the 50 and 100 fly were 11 yr girl club record times. Ella managed a further 3.5 second PB on her 400 IM in another new club record time – not bad for the last (very tough) race of the weekend! There was further excitement in Wales where Ollie IDen, Amber Brown and Jessie Brown were competing in the Cardiff Level 1 International Meet. Amber produced LC PBs in all her events and raced both the 200 & 400 free long course for the first time. Her 200 IM was a 17 second LC PB! Jessie made the 100 fly and 200 IM finals. She swam faster in both finals, her 200 IM being over 3 seconds faster and moving her from 7th seed to finish 4th! Ollie made two finals as well, but withdrew from the second one having already swum the 200 fly final! He went into the final 8th seed and finished 5th! Finally, a further 14 swimmers were competing at the Vanessa Knight Meet in Bognor. A quick look through the results and there were some good PBs there, along with plenty of medals. In the top ‘A’ graded time group Amelia Atterbury won Gold in the 12yr girls 50 fly and Silver in the 50 free. Zac Evans won Bronze in the 16yr boys 50 free, 50 breast and 100 IM. Logan Hickmore won Silver in the 9-10yr boys 50 back and Bronze in the 100 IM. Whilst Abi Pendleton won Silver in the 13yr girls 50 back & 100 IM and Bronze in the 50 fly. A great weekends competing by all. Congratulations to you all and thank you to all our lovely poolside helpers!